Russian minister describes the 2013 year in Russian foreign policy successes and challenges. In a January 21 press conference, Russian Foreign Minister Sergey Lavrov summarize the results of 2013’s major foreign policy issues, including the crisis in Syria, the relationship with Washington, and Ukraine’s volatile political situation. RBTH offers a summary of the event. Syrian crisis: Lavrov confirmed that Russia would take part in the Geneva II conference to advocate its current policy on kick starting dialogue between the different Syrian factions. "We are going to attend the Geneva conference... and advocate our approach, which is that direct dialogue between the Syrian factions should begin without any preconditions," the minister said. Lavrov added that it would be in everyone’s best interests to make the Syrian dialogue all-inclusive, "because the National Coalition is only one of the Syrian opposition factions." There are several other opposition groups working in Syria, Lavrov stressed. Relations with the United States: Productive cooperation between Russia and the United States on several key international issues has confirmed the great potential of the bilateral relationship, Lavrov told the press conference. "We are open to stepping up our partnership as fast as Washington is ready to go, based on respect for each other’s interests, equality, and noninterference into each other's internal affairs," he said. He added that some irritants still remained in Russia-U.S. relations. These include the deployment of the global missile defense system, and attempts at applying U.S. laws beyond U.S. borders against Russian citizens and companies. Iranian nuclear problem: A successful resolution of the Iranian nuclear problem is by no means guaranteed - but Russia and its partners will continue to seek a solution that would ensure regional security, including security for Israel, Lavrov said. “Together with our partners at the P5+1 Group and with the Iranian colleagues, we will continue to search for a lasting and comprehensive solution that would ensure Iran's inalienable right to develop nuclear energy under IAEA controls, while also ensuring the security of all countries in the region, including Israel," the minister said. Situation in Ukraine: Moscow is ready to act as a mediator between the Ukrainian government and opposition — but only if it receives a request to that effect. So far, there has been no such request, the Russian foreign minister said. 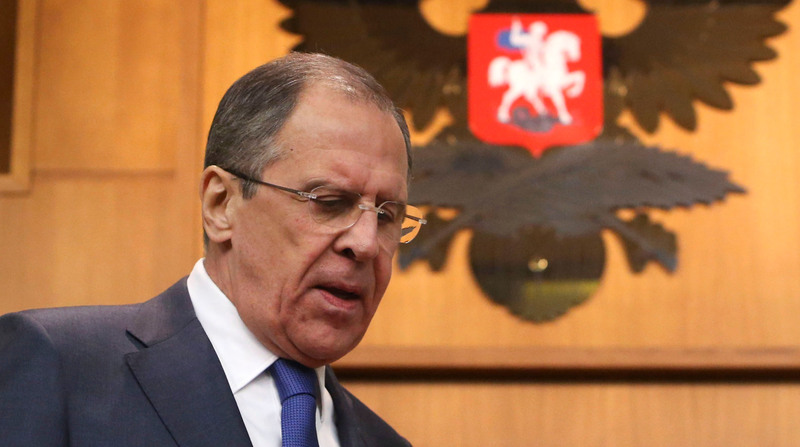 “We are confident that the internal problems of any state, including Ukraine, must be resolved through dialogue in the constitutional, legal framework, without any outside meddling," Lavrov said. North Korean nuclear program: Lavrov believes that the process of resuming the six-party talks could be started in the framework of a Russian-led working group. “When the six-party talks (on the North Korean problem) were still under way, several working groups were set up in that framework. Russia chairs the working group on drawing up the principles of peace and security in Northeast Asia," Lavrov said at the press conference on Tuesday. “Perhaps we could make use of that group to begin discussions and confidence-building." “These are our thoughts that we have shared with our partners at the six-party talks, in the hope for their speedy resumption," the minister said. He added that “the appearance of new nuclear-weapon states is unacceptable to Russia”. Relations with Japan: The first round of consultations on the problem of a peace treaty between Russia and Japan will be held in a few weeks' time in Tokyo, Lavrov told journalists. “In another several weeks, Tokyo will host the first round of these consultations. As both sides have agreed, our delegations will discuss some historical aspects of this problem. This is an extremely important starting point for any discussions of substance,” he said. He added that the recognition of the outcomes of World War II, as stipulated in the U.N. Charter, is a non-negotiable first step towards reaching a settlement that should be acceptable to both sides. "We are going to move along this path in a patient and meticulous manner," Lavrov said. Visa-free travel to Latin America: Lavrov is confident that in the foreseeable future Russians will be able to travel without visas to all the countries of the Community of Latin American and Caribbean States (CELAC). He also said that Russia had recently completed the procedure for entering into force a visa-free travel agreement with Paraguay. There are now 11 Latin American countries that have a visa-free travel arrangement with Russia, he said. This article is based on reports by the RIA Novosti news agency.